Mary Lou was a founder member of the Sackett Family Association and served on the committee from its formation in 2003 until 2008, becoming vice president in 2007 and taking on the role of acting president in 2008 when president Fred Sackett had to step down for health reasons. She had been an active Sackett family researcher from a young age, and was a member of the Sackett mailing list from its beginnings in 1997. Mary Lou is remembered with great affection by those Association members who had the privilege of meeting her at the Sackett reunion in Boston in 2006 and again the following year at Fort Wayne, a reunion which she herself organized. I grew up in Monroe County, Michigan, and lived most of my life there and in Hillsdale County, Michigan, where I live now. I have two grown children, Samantha and Terry Lee Knoll II, and four wonderful grandchildren and one great-granddaughter. My mother, Helen Beeken Miller Sackett, began researching when I was ten years old. I helped her over the years research her family, but she didn’t have much information on the Sackett line. In 1966 I graduated from Dundee, Michigan, High School and in 1976 from Monroe County Community College. After my divorce, I became a chiropractor, graduating in 1979 from Palmer College of Chiropractic. I am now semi-retired from chiropractic and currently very involved in helping people heal with lifestyle changes that include detoxifying the body and eating a raw vegan food diet, a lifestyle I follow since my discovery of having breast cancer in 2003. I spent three months the following winter at the Creative Health Institute in Union City, Michigan, volunteering, teaching and learning as much as possible. Later, I worked full time there for over three years. It has helped me tremendously, and I’m healthier now than I have been in years. 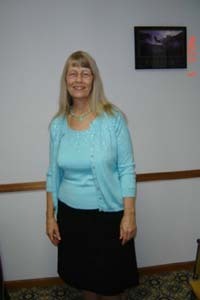 Besides working on my genealogy research, I am a member of the Hillsdale County Genealogical Society, past acting President of The Sackett Family Association, VP of Woman’s Life Insurance Society Chapter 734, member of Unity Church of Jackson & its Prayer Team, the Michigan Association of Chiropractic, and The Planetary Society. I am a Star Wars fan and an avid reader. Currently I am founder, owner and instructor at Back to Basics Naturally, a center to teach the detoxification and rejuvenation of the body through healthy living, a lifestyle that allowed my body to cure itself from cancer five years ago. Mary Lou's brother Lester L Sackett and niece Marlene Fitch are Sackett Family Association members. Member 2003–8; Vice President 2007–8; Acting President 2008. Boston 2006; Fort Wayne 2007. Oramel A Sackett bible records. 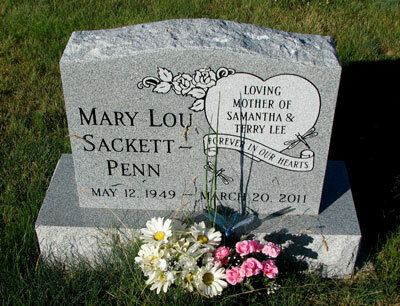 Dr Mary Lou Sackett-Penn has the distinction of being a double Sackett descendant following the marriage in her line of first cousins Mathew Dunham Sackett and Lois Louise Sackett. Chart Mathew Dunham Sackett & Lois Louise Sackett relationship chart. Dr. Mary Lou Sackett-Penn died on Sunday, March 20, 2011, at the McGuire Facility of Hillsdale Community Health Center of complications due to cancer. She was born in Ann Arbor on May 12, 1949. A memorial service will be held at Unity Church, 3385 Miles Rd, Jackson, 49201, on Saturday, March 26, receiving at 1 p.m., service at 2 p.m.